Section: RESPUBLICA (The State). View all emblems in this section. Haec ducibus Brutis cusa moneta fuit. Qualem missa manu servitia accipiunt. When Caesar had been destroyed, as a sign of liberty regained, this coin was struck by the leaders, Brutus and his brother. In chief are daggers, beside which there also stands a cap, such as slaves receive when set free. 1. Julius Caesar, who had become in effect the sole ruler of Rome, was assassinated on the Ides of March in 44 BC by Marcus and Decimus Brutus, Cassius and other conspirators. 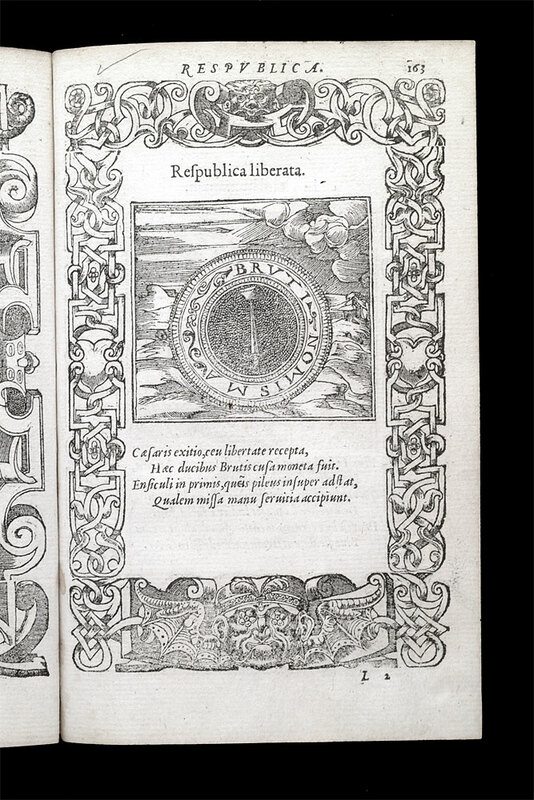 Alciato describes the well-known coin-type celebrating the restoration of republican government issued by Brutus after the murder. This bears the legend EID.MAR. (The Ides of March) across the lower section; above this, occupying the upper two thirds of the coin face, are two upright daggers with a cap of liberty between. 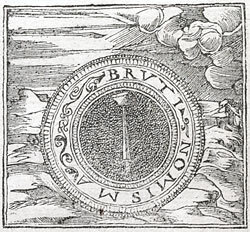 Alciato had presumably seen or owned such a coin. He wrote a short treatise on ancient coins.